Clth, 6.5 x 9.25 in. / 176 pgs / 83 color / 23 bw. The chief theorist of Art Brut and what has come to be known as Outsider art, Jean Dubuffet (1901-1985) created a genre and a moniker for a whole realm of previously ignored art--by the insane and the mentally ill, by children and by those simply too compulsive to move smoothly through the official channels of the art world. 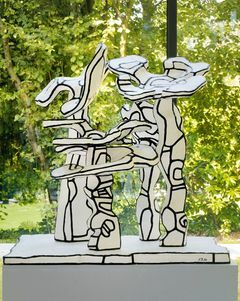 Dubuffet arrived at his conception of a "raw art" in 1942, after passing through and sloughing off Surrealism and other early twentieth-century avant gardes, and after a spell as a wine seller and puppet maker. By 1945 he was collecting examples of Art Brut, and had begun to write polemical essays attacking the cultural logic of post-Renaissance western art, instead advocating the potencies of a visceral primitivism. 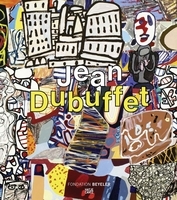 This beautifully designed clothbound edition of Dubuffet's influential writings gathers the artist's essays and interweaves them with reproductions of his late maquettes for his monumental walk-in pieces. Edited with text by Raphaël Bouvier. Text by Andreas Franzke, Catherine Iselin, Florence Queneau, Sophie Webel, et al. Preface by Sam Keller. FORMAT: Clth, 6.5 x 9.25 in. / 176 pgs / 83 color / 23 b&w.